Cyclists often have questions about Massachusetts bicycle laws, and about their rights and responsibilities. In Massachusetts, the law concerning bicycle safety is M.G.L c.85 § 11B. One of the most important aspects of the law concerns bicycle helmets. Cyclists age 16 and younger must wear helmets in Massachusetts. Breakstone, White & Gluck works to encourage cyclists of all ages to wear helmets through our Project KidSafe campaign. What roads can cyclists ride on in Massachusetts? Can cyclists ride on the sidewalks in Massachusetts? Do cyclists have to stop their bicycles at red lights in Massachusetts? Do cyclists have to use hand signals in Massachusetts? Can cyclists ride next to each other in Massachusetts? Where can cyclists park their bicycles? Do cyclists need lights on their bikes in Massachusetts? Do cyclists need reflectors on their bikes in Massachusetts? 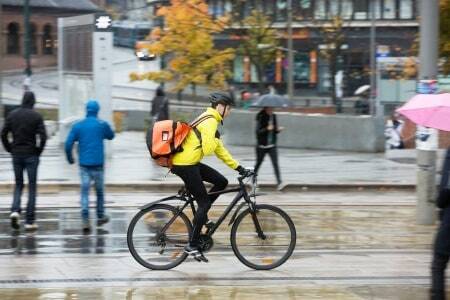 Do cyclists need Massachusetts auto insurance to ride a bicycle? In other words, cyclists may use all roads in Massachusetts except those major highways and limited access roads where posted signs prohibit bicycles. In other words, it is only okay to ride on the sidewalks in Massachusetts when it would be unsafe to do otherwise and a bicycle accident could result. When riding on sidewalks, bicyclists must yield the right of way to pedestrians and give an auditory (loud) signal when passing pedestrians. The City of Cambridge provides maps of banned sidewalk riding areas. Other communities may as well. Do I have to stop at red lights in Massachusetts? Yes. With the right to ride on Massachusetts roads, bicyclists are also bound by all the same rules of the road, with a few minor exceptions. One of these exceptions allows cyclists to pass cars on the right. Do I have to use hand signals in Massachusetts? Yes, use hand signals. Under Massachusetts law, bicyclists must use hand signals to show their intention to turn. However, cyclists do not need to signal ‘continuously’ and they do not need to signal if they need both hands on their handlebars to ride safely and avoid a bike accident. 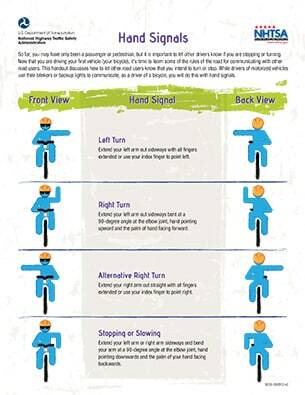 The hand signals poster was developed by the National Highway Traffic Safety Administration. You can download a larger copy of the poster here. Yes. This is one of the rules that changed with the new Massachusetts bicycle laws. Under the new law, up to two cyclists can ride next to each other, so long as they stay in a single lane. However, it is still good practice to shift to a single-file line if cars are getting backed up. Courtesy goes a long way to maintaining good relations between cyclists and motorists. Where can I park my bicycle in Massachusetts? Under Massachusetts law, bicycles can be parked anywhere on a sidewalk or road so long as the bicycle does not obstruct the flow of pedestrian or vehicle traffic. Yes, if you intend to ride after dark. Under Massachusetts law, cyclists are required to have a white light facing forward and a red light facing backward from thirty minutes after sunset until thirty minutes before sunrise (the darkest times of day). Yes, if you intend to ride after dark. Under Massachusetts law, cyclists must either have reflectors on both pedals facing front and back or reflective material around their ankles facing front and back. This rule applies to riders from thirty minutes after sunset until thirty minutes before sunrise (the darkest times of day). That is an excellent question. Please read our article, "What Every Massachusetts Bicyclist Needs To Know About Car Insurance." Cyclists are not required to carry special coverage for bicycle accidents in Massachusetts. But through their auto insurance policy, cyclists can purchase extra coverage to protect themselves from injuries related to bicycle accidents. This is important because if you are hit by a driver, that driver may not have enough coverage to pay for your injuries and lost wages. If you are injured in a bicycle accident, the most important thing to do is to obtain immediate medical care. You should then seek legal advice. If you were injured, or if there is substantial property damage, Massachusetts law requires you to file a crash report with the local police department in the city or town where the bike accident occurred. You also need to report the claim to insurance companies, including the company for any vehicle involved in the accident as well as your own insurance company. We urge you to contact an experienced Boston bicycle accident lawyer before preparing any reports and especially before contacting an insurance company. Learn your rights. Do not fill out any forms or sign any releases without proper representation. For help, contact Breakstone, White & Gluck today for a free legal consultation at 800-379-1244 or 617-723-7676 or use our contact form. Breakstone, White & Gluck is committed to bicycling safety in Massachusetts. Since 2013, we have donated over 20,000 children's bicycle helmets through our Project KidSafe campaign. We have been proudly recognized as a Silver-Level Bicycle Friendly Business by the American League of Bicyclists for our bike helmet donations and our support of cycling clubs and organizations. These organizations include MassBike, Boston Cyclists Union, Northeast Bicycle Club, Charles River Wheelmen, Bikes Not Bombs, and the New England Mountain Bike Association.